The War On Drugs is the brainchild of Philadelphia-based Adam Granduciel. The group release their ambitious second full length album, Slave Ambient, on August 16th. There is a whole heck of a lot going on over the course of this record. The War On Drugs' songs are complex and engaging, drawing upon a seemingly endless catalogue of influences. The record opens with "Best Night". The first thing to strike you is the modern exploratory guitar work, which you could easily hear coming from Lee Ranaldo. The band uses that sound to adorn the track's earthy roots rock foundation. The lead single from the record is "Baby Missiles". It's an elaborate, sprawling epic that boasts plenty of that earthy feel. It could be the closest thing anyone has come to recreating The Arcade Fire sound aside from The Arcade Fire. You will lose yourself amongst multi-faceted and vibrant songs like "Come To The City" and "Brothers", both of which immerse you in their sound. With a track like "Your Love Is Calling My Name", your are meticulously prodded along by a well-paced driving flow. It's with those numbers, and the spacey country-ish track "I Was There" that you are exposed to the other obvious reference point: A Storm In Heaven-era The Verve. Granduciel has a unique vocal style as well. Somehow he manages to combine a Bob Dylan-esque mumble with a Richard Ashcroft tone. Far from being the trainwreck that my description would imply, the results are rather compelling. 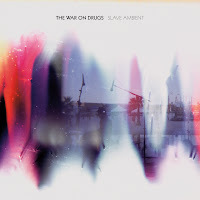 If you're the type of music fan who looks for an album to explore and get lost in, then you may not have an opportunity this year than Slave Ambient. The War On Drugs play the Drake Underground in Toronto on August 24th. Best tracks: "Baby Missiles", "I Was There"